Missouri is home to numerous medical assisting programs. With job growth in the double digits, medical assistants might find that they have many opportunities for hiring and advancement, especially if they have earned certification. Further specialization might also be desirable for those who are motivated to learn and experience more in the healthcare field. Those who wish to work with children or in poverty-stricken areas will find opportunities available in the state through rural clinics and children's hospitals. Missouri is striving to create guidelines to more clearly define scope of practice for medical assistants and other unlicensed personnel, such as phlebotomists. Continue reading to learn more about salary, job growth, spotlight schools and other details of medical assisting in Missouri. If you’re interested in a career in medical assisting, you join a big pool of altruistic professionals who have others’ needs at the top of their minds. Medical assistants hold a degree or certificate in the field and work in a variety of environments, including clinics, physician offices and hospitals. To get started, you need to find a quality program that offers the benefits and services you need to be successful. 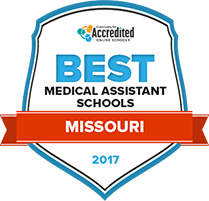 We’re helping you with your research with our result for the Best College for Medical Assisting in Missouri in 2017 based on comprehensive analysis of tuition rates, career placement, class sizes and other factors. Check out the top school below. East Central College's medical assistant program adheres to learning plans that are developed by organizations like the American Association of Medical Assistants and the Medical Assisting Education Review Board. In addition to learning how to schedule patient appointments, managing patient and insurance company billing records and updating electronic medical records, students also learn how to draw blood, record patient vital signs and position patients for medical procedures. It's possible to graduate from the program within less than year. At the end of the training, students are awarded a medical assistant certificate. How does Missouri define medical assistant? Missouri does not offer a firm definition of medical assistant, beyond statutes that make reference to unlicensed assistive personnel. In fact, there are very few guidelines set forth by the state to regulate the work of medical assistants, though lawmakers are striving to change that. The Missouri Board of Nursing makes it clear that unlicensed health personnel can only be delegated light nursing duties that do not require a license; delegating anything that is under the auspices of licensed personnel is illegal. Certification is not required in Missouri; however, many students choose to pursue certification as part of their career path. In order to receive certification, a student must complete an approved program in medical assisting. This might be anything from a certificate to an associate degree. The state does not require formal education or training to begin work. However, some employers do require certification, and medical assistants may not be delegated tasks that they have not been trained for. Since formal education or training is required in order to obtain certification, it makes sense for aspiring medical assistants to attend an approved training or education program. Are there tasks outside the scope of medical assistants in Missouri? "Unlicensed health care personnel who perform specific nursing tasks without benefit of instruction, delegation and supervision by licensed nurses may be engaged in the practice of nursing without a license. Such actions by unlicensed health care personnel are a violation of the Missouri Nursing Practice Act. Unlicensed health care personnel remain personally accountable for their own actions." The salaries of medical assistants depend upon a wide variety of factors, including employer budget, education and training levels, certification, years of experience and more. Another factor is geographical location; some states simply pay more than others, thanks to their local economies. Here's how Missouri stacks up against the rest of the nation. Breaking it down even further, there are varying salaries across a single state, depending upon the geographical region within that state. For example, a metro area might pay much more than a more rural area - though this is not always the case. To get the facts on how different regions of Missouri stack up against each other, check out the chart below. The state of Missouri will add an anticipated 330 new jobs each year for medical assistants from 2012 to 2022, according to Projections Central. That translates to an employment increase of over 16 percent. Missouri Here's how the state rates against the national growth rate for medical assistants. The Missouri Board of Nursing has set forth a clear statement on what exactly unlicensed assistive personnel can do, and what requirements must go along with delegation from a licensed nurse. The Missouri Society of Medical Assistants is an affiliate of the AAMA with the primary goal of bringing medical assistants across the state together to further the interest of Missouri medical assisting professionals. Missouri's medical practice statute concerning what an unlicensed professional is able to do.